A 2-in.-diameter steel tube with a wall thickness of 0.05 inch just fits in a rigid hole. 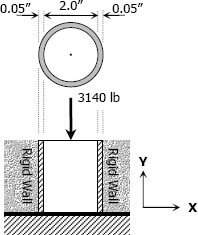 Find the tangential stress if an axial compressive load of 3140 lb is applied. Assume ν = 0.30 and neglect the possibility of buckling.